There are parts of London which are so exclusive the lack of a local underground station is totally irrelevant. Residents here take taxis (the black cab sort) or have a private driver when they travel. And, they have the Painted Heron on their doorstep when they want a curry. Actually, it’s not that hard to reach The Painted Heron, there are plenty of buses from Sloane Square along the Kings Road. And, it’s definitely worth the journey. 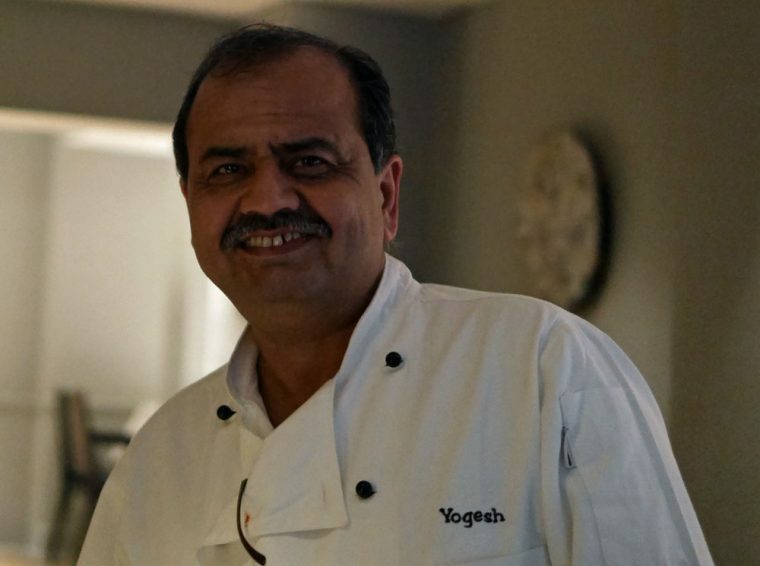 Having opened in 2002 under chef patron Yogesh Datta, the place has won a fistful of awards and is clearly a popular local venue. I was joined on this occasion by my curry loving God Daughter who has developed a fiercely critical palate. Our mission – to eat our way through the new summer menu through a range of sharing dishes. Poppadums and home made plum, wild garlic and mango chutneys to accompany a colonial gin and tonic made a classic start to the meal. After that, things went a little more off piste. 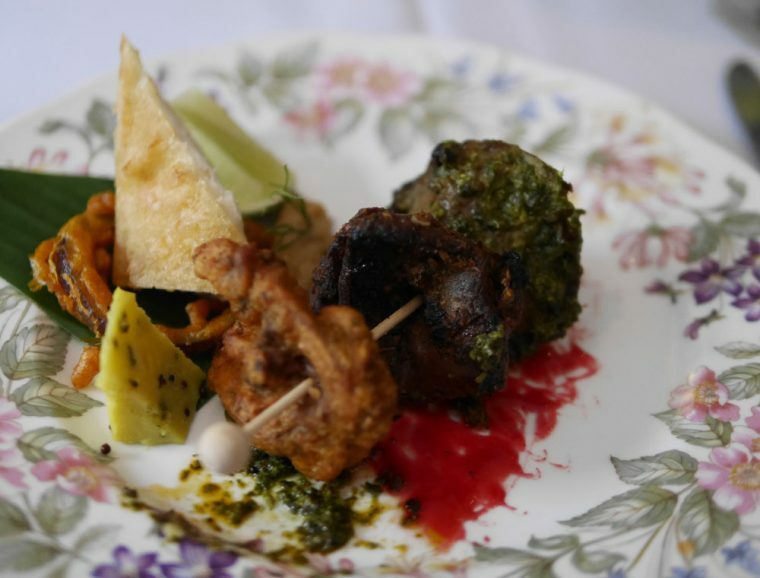 I picked the game mixed starter plate which offered a wood pigeon breast, quail and Gressingham duck tikka. Flavours were great with carefully spiced meats, but the meats were all rather well done for my own personal taste. 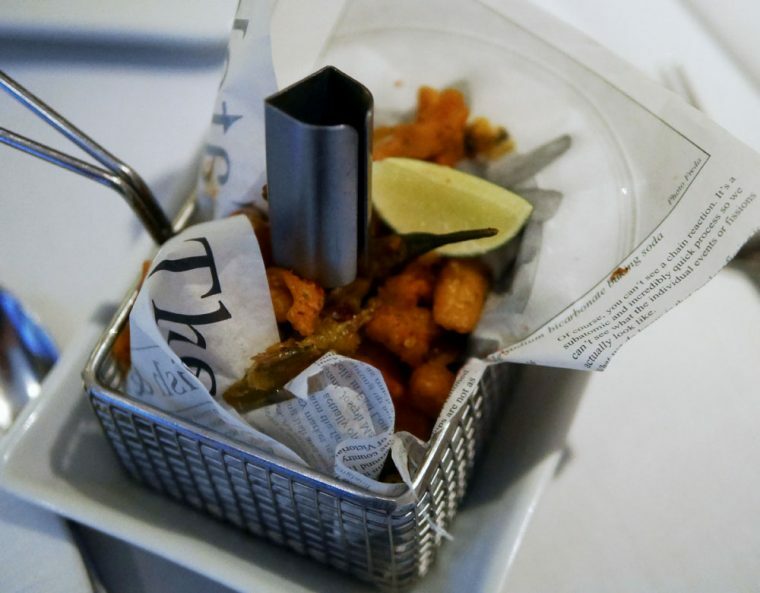 And, I was just a little jealous of the seafood plate, which had tandoori black tiger prawns and soft shell crab along with a pollock fish tikka. Next time! A tiny palate cleanser of avocado lassi was a welcome smooth and dainty mouthful. Once the mains came, I made up for my lack of fish starter by eating a large quantity of the delicious black tiger prawns with hot and sour Goan spices. 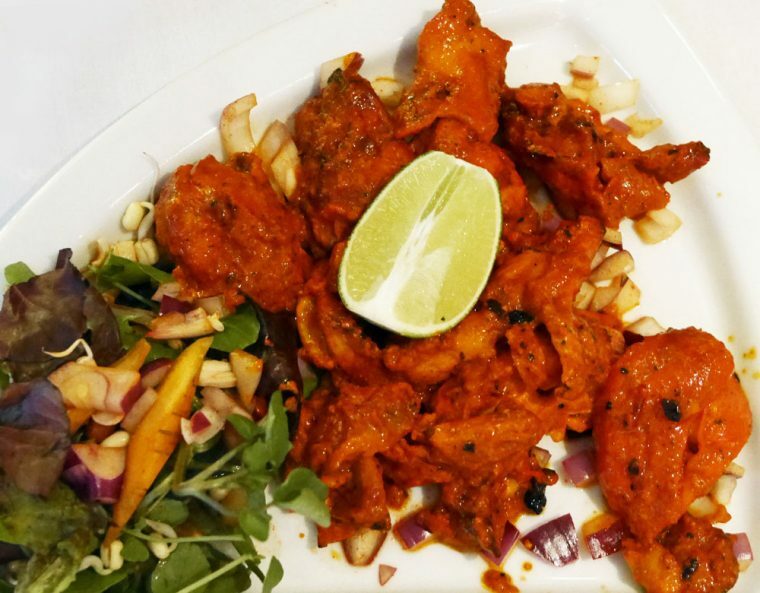 It was my favourite of the dishes I tasted that evening, though closely followed by what my God Daughter declared to be ‘the best chicken tikka’ she’d ever eaten (a chicken tikka sweet chilli). 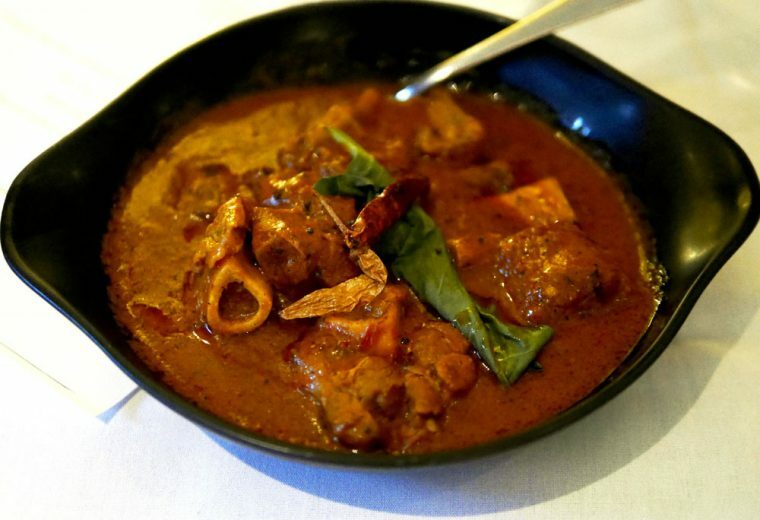 Rose veal was stir fried with spices to make a delicious and moderately hot dish. By comparison, the lamb shank Osso Bucco in a super hot curry sauce with sorrel, was a wonderfully warm and comforting dish that perhaps would work better during winter. 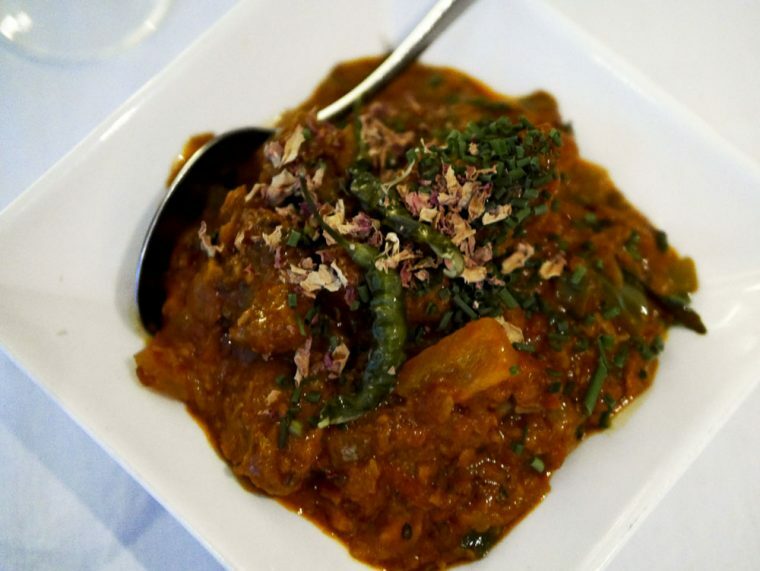 I love hot curries and didn’t find this beyond my own palate. Rich from slow cooking on the bone, it was very moreish. By this stage, I was on the point of skipping dessert due to extreme over indulgence. 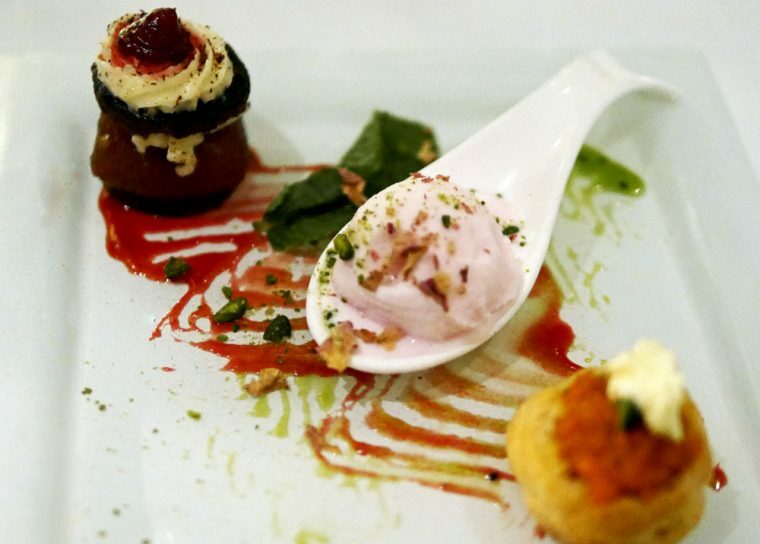 But, I was easily persuaded by the pretty plate of carrot halwa profiterole, gulab jamun black forest and rose petal ice-cream. Tiny portions meant that nothing here was overwhelming and we could focus on the beautiful palate of flavours and textures. It was excellent all round dining. Service was exemplary and the restaurant had a pleasant ambience – elegant and refined without being in the least bit stuffy. I’d happily have this as my own local Indian and from the busy dining room, I suspect even the well-heeled residents of Cheyne Walk feel the same way. Disclosure: I was a guest of The Painted Heron – all comments are editorially given. Looks sooooooo good. Sham Chelsea is so far away. Wow.. what a terrific meal. I love prawns and most of the other dishes. Not tried everything there. (not often offered here in the US). Indian food has such a range of flavors! !